Chinchillas are a small rodent native to South America, found in rocky, arid areas in the mountains. They are best known for their incredibly soft, thick, luxurious fur. In the wild, this fur protects them from the elements, but in captivity, it makes them somewhat susceptible to overheating. This must be considered when deciding where to place your chinchilla in the house. A cooler, quiet area of your home is the best place to put a chinchilla cage. The larger the cage, the better. The minimum floor space is about 24 by 24 inches, and a tall cage is best; if possible, get a tall cage with shelves and ladders that allow the chinchilla to climb. Wire is the best cage material, and avoid plastic cages or accessories and chinchillas chew and destroy plastic readily. The tray can be lined with wood shavings (avoid cedar shavings, and hardwood shavings such as aspen are preferred over pine), or newspapers. Many chinchilla cages have a wire floor, which is nice for cleanliness but can be hard on chinchilla feet so are best avoided. Wire floors or shelves can be covered with wood to give the chinchilla's feet a break. A nest box, made of wood, should also be provided. The cage should be placed in a quiet area of the home where human activities won't disturb (and stress) them during the day. The cage should also be located in a cool area (no drafts) and not exposed to direct sunlight which could cause overheating. Summertime temperatures must be monitored to make sure the ambient temperature is not much over 77 F (25 C). If you do not have air conditioning, placing a shallow pan of ice cubes in the cage may help, or drape a damp towel over part of the cage. 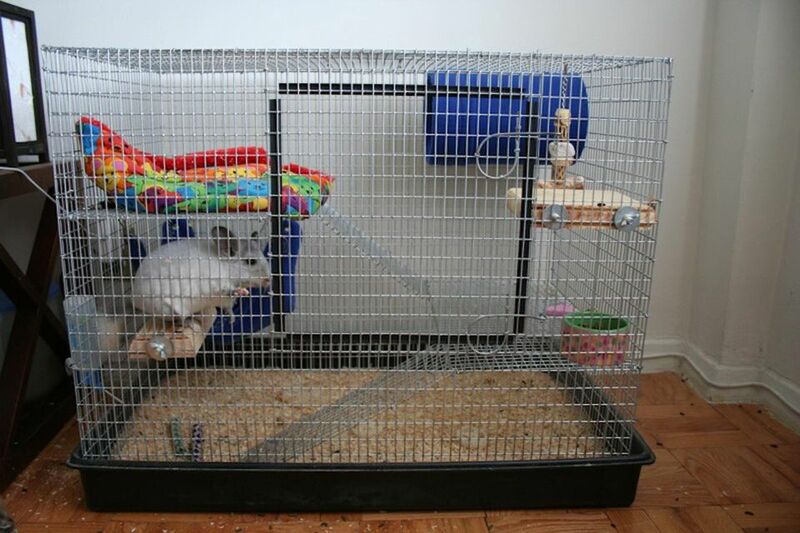 Place the cage on a table or stand as this will help make the chinchilla feel secure; chinchillas can be intimidated if you must lean over the cage to interact with them. Glass water bottles are ideal because the chinchilla can't chew through them. If you use plastic, encasing it or creating a barrier to it with wire mesh should reduce the risk of damage (you can also get commercial chew guards). For feeders, hopper style feeders that attach to the outside of the cage are nice because they can't be tipped and the chinchilla won't be able to urinate in their food. If a food bowl is used, it should be a heavy ceramic bowl to reduce tipping, and it must be cleaned daily. Toys can be provided too - blocks of wood and tree branches (free of pesticides) are good chew toys. Some of the wooden parrot toys make good toys as well, as do the willow balls and rings that you can find for rabbits. It is important to provide toys that do not have small or plastic parts that could be ingested. In addition, a "chinchilla block" or pumice block can be provided for chewing and this will aid in keeping the teeth trim. Wheels can provide excellent exercise, although you may find that unless the chinchilla is introduced to the idea at a fairly young age it may not take to running on a wheel. Look for a 15-inch wheel (anything smaller will be too small for most adult chinchillas), with a solid running surface and an open side with no cross supports. Some people also find the use of running discs like the Flying Saucer a good option for chinchillas. The risks of overheating make the use of plastic run about balls undesirable. Your chinchilla would much rather run around in a secure, chinchilla-proofed room.